April 10th in Debugging Plug-ins, Wordpress Plugins by Wordpress Jedi . In the past few years, we have covered plenty of text-to-speech scripts that can make your site more user-friendly. The technology has improved a lot over the years. 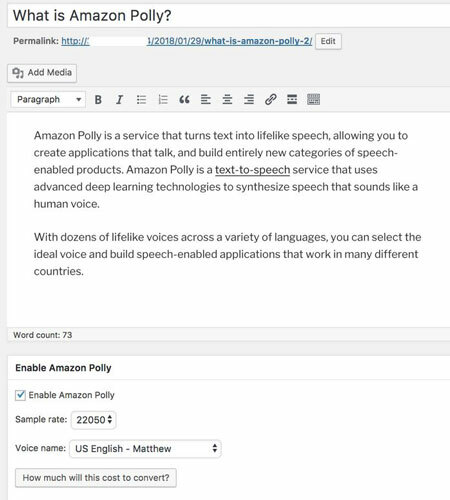 Thanks to the Amazon Polly plugin, you can add realistic text-to-speech functionality to your website. It allows you to share an audio feed of your content with your audience. June 7th in Debugging Plug-ins, Free Plug-ins by Wordpress Jedi . WordPress is an amazing content management system. Not only you get the backing of the open source community, you get a CMS that has been tested and optimized time and time again over the past few years. And the folks behind WordPress keep improving it. As good as WordPress is, things can still go wrong. So as a webmaster you should be ready to debug your install to find out what’s wrong. You can always go and play with your source code, or you can do the smart thing and get a debugging tool to help you identify issues with your blog. WP-Devel is a powerful WordPress plugin that gives you the information you need to find out what’s wrong with your WordPress install. It makes it easy to find out your site’s load time, your HTTP headers, included function, and even your PHPinfo. These are all useful information to have when you are trying to optimize your website’s performance. Once you install WP-Devel, you are going to see a bar at the top of your blog that you can use to easily access the debugging tools available with this plugin. You also get a whole lot of information at the bottom of your pages (see above image). You can also choose to hide your sensitive information to make sure you don’t compromise your blog’s security. Overall, WP-Devel is a great plug-in for anyone interested in getting their hands dirty with the technical side of things. If you have a blog that is not performing right or have technical WordPress issues, WP-Devel is a good place to start.